Chief Constable Bob Skinner has retired from the police force but he has not retired from investigating. Sir James Proud, Skinner’s predecessor in the Edinburgh chief’s job and his mentor, has called him for help. A murder investigation that has been closed for three decades has come back to haunt “Proud” Jimmy and only our man Bob Skinner can help him. “The Body in the Quarry” case which involved the murder of a local priest and the conviction for murder of a suspect called Barley Meads, who had a clear motive, has come back to the fore, thanks to a blogger/investigator by the name of Austin Brass. Sir James has his reputation on the line, so Skinner agrees to attend a meeting with Brass in place of Proud to discover what is going on and if his accusations stand up to scrutiny. But Brass never turns up for the meeting and Sir James disappears. Skinner is going to have his work cut out to find the truth. 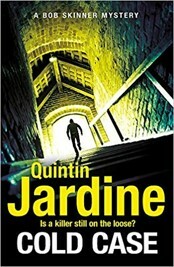 Jardine’s book is a thoroughly satisfactory murder-mystery. As a first-time reader of this series, I felt that I was missing a bit of background information but the book holds up as a stand-alone novel. The main focus is on Skinner, of course but there are many appearances by characters that will be very familiar for long-time readers of the series. People like D.I “Sauce” Haddock and Tommy Partridge play important roles. My only gripe [and I repeat I am a first-time reader of the series], is that Skinner seems too perfect. He is a dedicated family man, well-liked by everyone who knows him, fashion-conscious, great at self-defence and holds a knighthood too boot. But there is a strong possibility that he has earned his comfortable place in life. This is, after all, the 30th Skinner novel and his twenty-fifth anniversary, so my quibble is a minor one. I enjoyed the book and his vast legion of fans will love it.